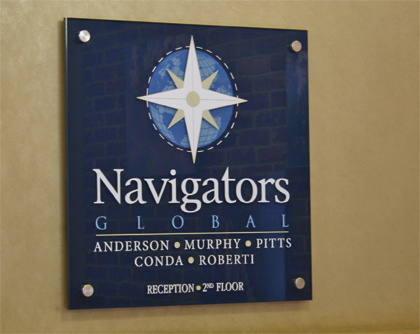 Custom glass signs are one of the most versatile products that Classic Glass has to offer. 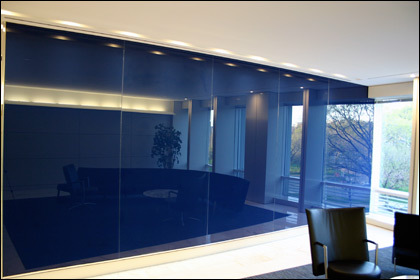 Glass can be fabricated to just about any kind of shape, size and hole specification. In addition, several treatment options including etching, carving, painting and even cast glass are available. There are many ways to reproduce your logo or message onto glass and our artisans are happy to make recommendations based on the intent and function of the space. 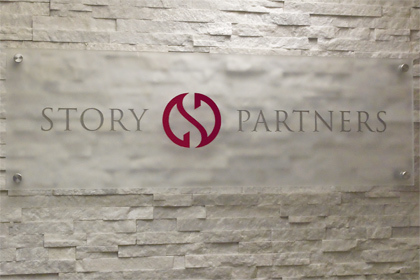 The custom glass sign for Story Partners (above) is a great example of using an etched treatment to serve a specific function. Because of the logo’s grey type, and to maintain the overall clarity against the stone wall; Classic Glass recommended that the back of the sign be surface etched and the logo painted on the front surface. The effect diffuses a small area of the stone wall and allows the logo to be viewed without distractions. This ultimately gives Story Partner’s glass sign greater impact. 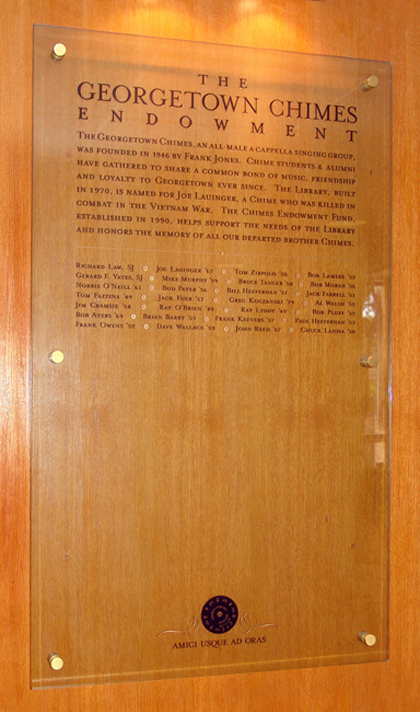 Glass donor walls are typically used in two ways; to recognize the financial contributions of an individual or group, or to memorialize an individual after he/she has passed. Classic Glass produces this type of signage for organization’s like the Georgetown Chimes (above) The John F. Kennedy Center for the Performing Arts and Temple Beth Ami to name a few. When it’s time to update a name(s) Classic Glass will pick the sign up, fabricate the new content and then re-install the sign until the next update is needed. Attractive glass signage could not be any easier! Curved leaded glass panels for the Halstead Square lobby, Tysons Corner VA.
A recent leaded glass installation by Classic Glass, Inc. posed an interesting challenge for resident stained glass artist Rudi Waros and designer Jacob Robison. 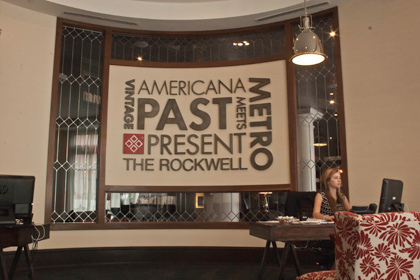 Although the client sought a design that was rather simple; the leaded glass panels for the luxurious Virginia apartment lobby needed to wrap around a curved opening. For visual continuity, it was determined that the design of the sidelight panels needed to align and match the size of the diamonds running across the curved middle panels. Upon completion of a field measurement, decorative glass artist Rudi Waros constructed a wooden template to match the curve of the existing opening. 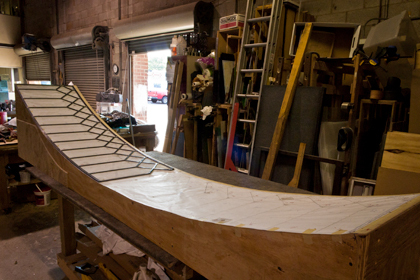 The contour of the template resembled that of a “half-pipe” allowing Rudi to tightly construct the leaded glass panel to fit exactly when installed. The individual glass pieces are flat, not curved, but when divided into narrow sections (such as this design) can be constructed to precisely follow the contour of a curve. Installation day is always a little nerve racking no matter how routine the job may be – weeks and months of planning and execution all culminate on that day. With over 30 years of experience, Classic Glass’ skilled glass artisans completed this installation with precision and professionalism. 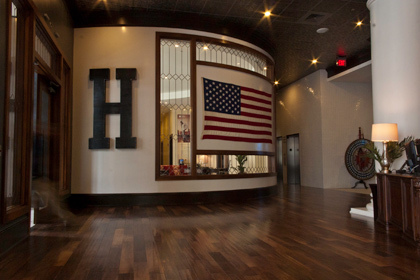 The curved glass panels fit perfectly into the opening and our client at Halstead Square could not have been happier. Decorative glass artisan Rudi Waros recently completed a beautiful stained glass window at St. Pauls Episcopal Church in Northwest, Washington, DC. Founded in 1712, the congregation is the oldest religious institution within the boundaries of the present-day District of Columbia. Rudi designed this window to have an “old world” feel that compliments several existing stained glass panels throughout the church. 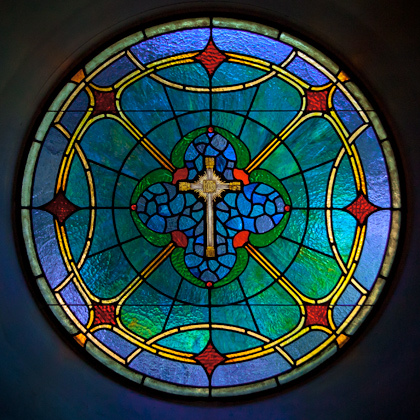 Hand selected sheets of� Youghiogheny cathedral glass were used to create this 40″ diameter stained glass window. Each sheet of glass has its own unique character and it’s the glass artists job to select the most appropriate glass for a given project. Rudi selected the gradient qualities of the orange to bright yellow areas to highlight the inherent functionality of the glass. The result draws the viewers eye around the window’s design and creates a visual interest that is very pleasing. The other green/teal and red areas utilize the glass’ natural depth of color and unique sparkle; the interaction between light and glass is truly intriguing, almost as if the window is alive! For the center section of the stained glass window Rudi used Bullseye clear iridized glass. 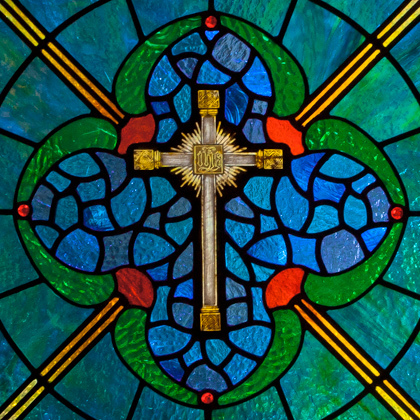 He hand painted the cross and then fired the glass in a kiln to achieve the desired look. This effect creates an attractive contrast that pulls the viewers eye to the center of the stained glass panel. As of September 1, 2010 Classic Glass, Inc. has moved its decorative glass fabrication facility to Bladensburg, Maryland. All commercial glass deliveries should be taken to this new location. 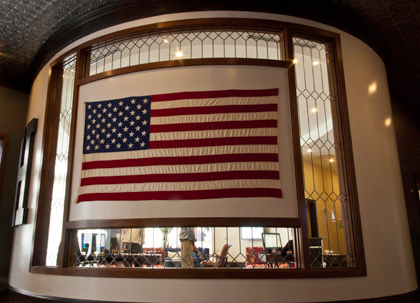 Classic Glass will also maintain a decorative glass showroom in Alexandria, VA. 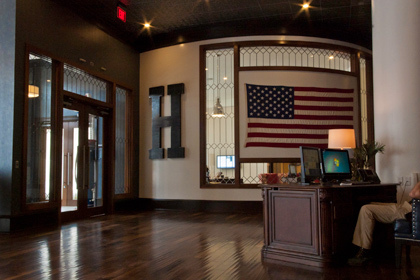 Please note that clients will need to schedule an appointment to meet at the new showroom location. We appreciate your continued support and patience while we settle in to our new facilities.